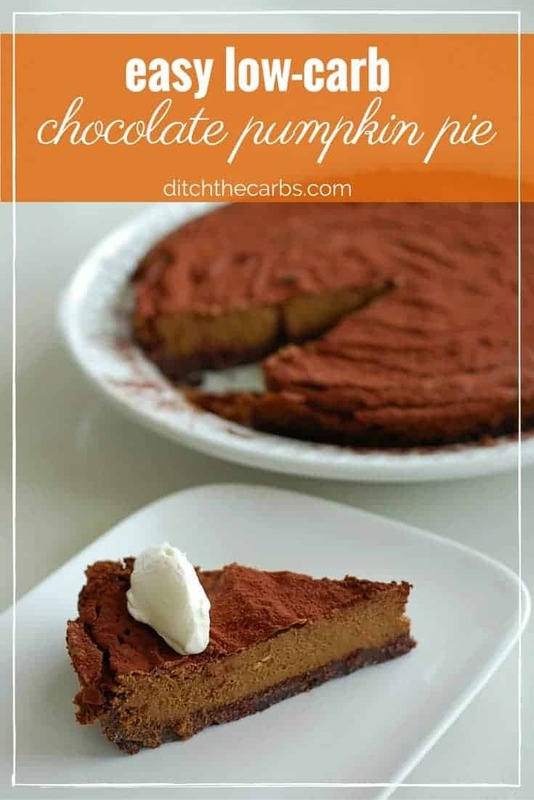 Have you been looking for an easy low carb chocolate pumpkin pie recipe? Do you have leftover cooked pumpkin and need to use it up? 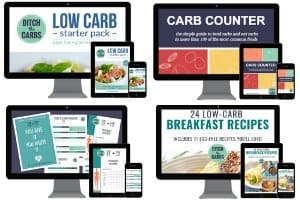 Do you want a recipe that has no sugars and no grains? 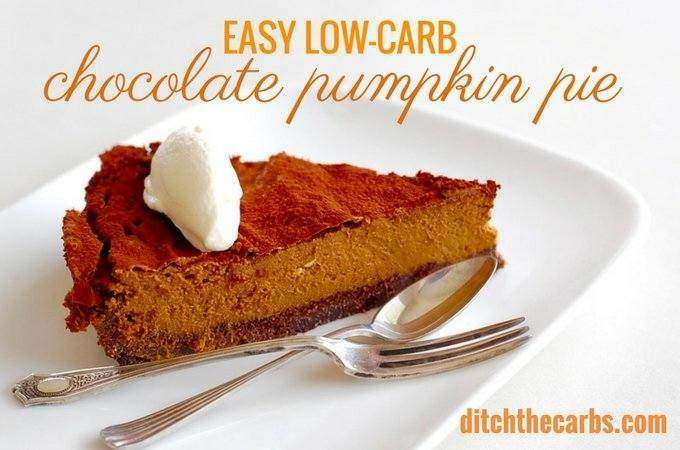 Then this easy low carb chocolate pumpkin pie is just for you. Scroll below to watch my new quick cooking video just added. You can see how easy this is to make. Pumpkin is a really versatile low carb vegetable to use in a variety of low carb dishes. It can be flavoured as either savoury or sweet. It can be used in soups, roasted, mashed with butter and garlic, and baked in desserts like this one. Pumpkin nutrition values per cup (116g) – 30 calories, 8g total carbs, 7.4g net carbs. 0.6g fibre, 3.2g sugar, 197% Vit A, 17% Vit C, 4% iron, 3% magnesium and 2% calcium (% daily values). Pumpkin pie spice mixes is an American mix that will commonly use a combination of cloves, cinnamon, ginger, nutmeg, and sometimes allspice. What is the difference between allspice and mixed spice? Allspice is made from one spice – the ground unripe berry from the juniperr tree. Mixed spice is a combination of cinnamon, cloves, nutmeg, coriander, cumin, caraway, ginger, mace and allspice. There are numerous mixed spice variations in each country. Mixed spice may also be referred to as pudding spice. UPDATE: Learn how to make your very own homemade pumpkin pie spice. I add an extra spice to mine to give it that va-va-va-voom. Print the recipe here, and make a jar of your very own pumpkin spice to give to friends and family. Easy low-carb chocolate pumpkin pie is an absolute must recipe to make when pumpkin is in season. Enjoy it hot or cold with whipped cream and nutmeg sprinkled on top. Mix all the ingredients together in a food processor (or bowl) then press into a buttered and lined pie dish. Bake at 180C/350F for 15 minutes. I like my pumpkin pie crust to be slightly under baked and it will be baked again with the pie filling. Put everything in a food processor and pulse until smooth. 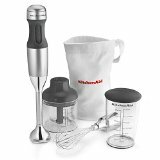 Alternatively place the ingredients in a large mixing bowl and mix by hand, or use a stick/immersion blender. Once the chocolate pumpkin pie filling is smooth and lump free, pour onto the baked chocolate pie base. Bake at 180C/350F for a further 20 minutes, or until the centre is cooked through and a knife comes out clean when testing the centre. Dust the top with cocoa powder and serve with whipped vanilla cream (optional). Just whip heavy cream with a little vanilla and sweetener to taste. Serve on the side or use the vanilla cream to decorate the top. Leave me a comment and tell me which pumpkin recipe you’d like me to develop next. Soup? Muffins? Spiced latte? Bread? For more low carb dessert ideas, click here to visit my recipe baking/dessert finder. 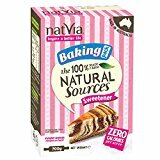 Discover how to give up sugar for life! Sign up for my FREE 5 day mini email course. 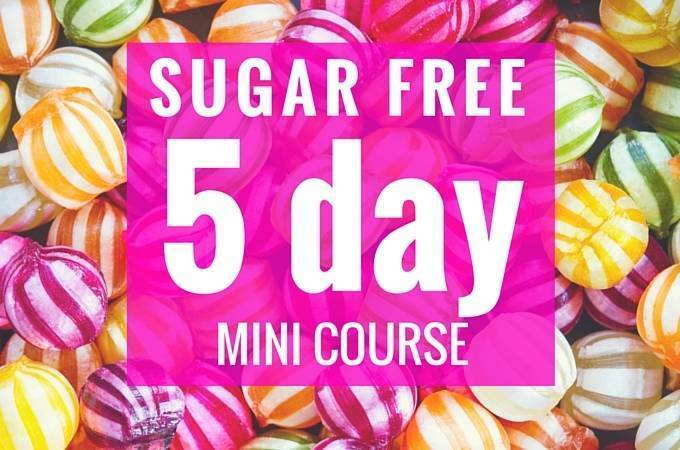 Keep the momentum going and live sugar free for life! Get secret discount codes for subscribers only. Success! Now check your email and let's get started! If you omit the dry cocoa powder, you would need to add another teaspoon or two of coconut flour. Maybe add some spices in there too. Okay, not sure what happened here. Followed the recipe exactly, and my pie did not cook in 20 minutes… or 30 minutes! There was so much pie filling it would have had to cook for about an hour to get anywhere near done. At 30 minutes, I pulled it out of the oven, spooned out about half the filling, and put it back in the oven. The crust is already starting to burn, so we’ll see what happens. Out of curiosity, do you know what I did wrong? Using a 9″round pie tin. In your recipe you don’t include butter for the pumpkin filling but in your video you do include it. Is this a mistake? Canned pumpkin is 15 oz…could the extra two ounces be added without any major problem or is there a way to compensate for the extra. I don’t want the other two ounces just hanging out as it won’t get used! Should this be served hot or cold? I’m looking for things I can keep in the fridge. Either. We ate it warm from the oven then cold the next day from the fridge. I think I slightly preferred it cold. I made this yesterday. I’m sorry but it was awful. I threw it out. 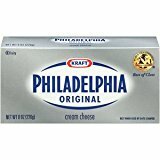 No I use the full fat cream cheese to keep the fat content high. That is what will keep your hunger stable and the carbs away. You may wish to read this page on why we eat high fat and why we should be avoiding low fat. Fabulous idea. They would be more akin to little pumpkin mini cheesecakes (which would be incredible) but I will try to develop a muffin recipe also. Thanks for the suggestion. I think my cream cheese must be different. It is not salty at all. This is what I use. I just use leftover pumpkin that I have either boiled or roasted for dinner. I am in the habit of making extra everything now so this pumpkin pie is a great way to use leftovers. Looks yummy. Could we have an Rss feed please, for those of us who don’t do social media. You can subscribe here and you will receive my free eBook. You will then get emails from me and updates so you don’t have to use social media at all. I also have secret discount codes for subscribers too. Will it come out as plain pumpkin without the chocolate? Yes, that would be lovely too. My sweetener of choice is maple syrup. Is that allowed? I don’t want to eat chemicals.